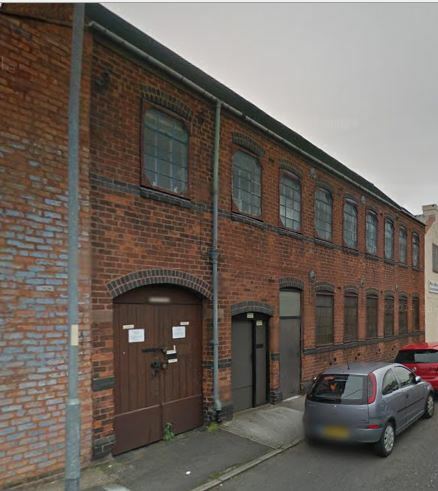 "ROBIN HOOD" is a trading or brand name used by "TOY PRODUCTS Ltd" who had a factory situated in Argent Works, Bott Lane, Walsall* between the mid 40s and 1955. 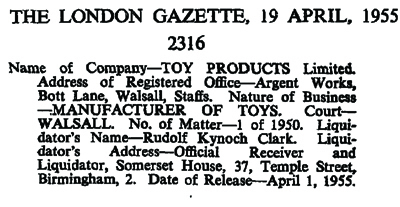 "TOY PRODUCTS Ltd" were a toy manufacturer but I can find little information on the company other than this listing in the London Gazette, 19th April 1955, when the company was in Receivership. What I do know is they produced a series of metal cars and trucks, sometimes under the brand name "Robin Hood". Around 1948 some of the models were released with clockwork motors included. Some sources claim "Robin Hood" is a trademark belonging to TP, but this is not so as the only "Robin Hood" trademark issued in the UK for a Toy (class 28 according to the UK Intellectual Property Office) was issued on 28 April 1947 to The Walt Disney Company Limited, 31-32 Soho Square, London, W1V 6AP, United Kingdom. This trademark lapsed on 28 April 1996 and has not since been renewed. another saloon as a Mercury. Construction of the model cars is basic - a one piece body without a base plate that incorporates the bumpers, front grille and, in the case of the open sports cars, the seats and steering wheel. Plain paintwork is common with, occasionally, silver painted detail. A clockwork motor was introduced for several models at some time after 1948 (these models have a hole for the key on the left side of the body and the motor resided within the body casting). The models I have seen all have unpainted metal wheels without a normal axle - they are fixed to the body via a column cast onto the body at each wheel position and the wheels are press fitted between the column and body. When viewed under a loupe it is quite clear the wheels are cast as one piece with a raised dome on the outer side and a short pin on the inner side. This pin fits into a hole, cast in the column, to secure the wheel. The lorries are cast in two parts - they have a common chassis and cab casting and interchangeable rear body parts (flat deck, tipper wagon, tanker, furniture van). The wheel assembly is the same as described for the cars. These trucks are generally found with a chassis/cab casting in a single colour and the rear with one or two colours applied. The Petrol Waggon appears in several different colour schemes with the petrol brand name "POOL" written on the tanker. Some variations can be found on the models within the TP series. These include rubber wheels on the mechanical (clockwork) models and metal wheels on the free-running models. The actual main body castings can also be different, e.g. the Midget Sports Car (the previously mentioned Dodgem/Bumper car) is known to exist with a separately cast spare wheel (which can break off easily) and a "spare cover" cast into the body. 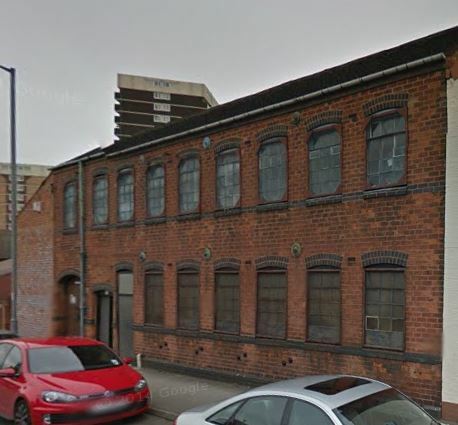 the models have no trademark, no country of origin and no reference number - the only way to identify in this case is from photographs of other known models. Actually, I have yet to find a model with a reference number on the casting. the origin "Made in England" is cast on the under side of the body and the casting is the same as photographs of known models. the brand name "ROBIN HOOD" and the country of origin "Made in England" are cast on the under side of the body. Further identification can be made certain by the model's box (if present) - this is often a beige card box with brown lettering and images but it can also be found with blue or green lettering and images (later versions). On the two large sides of the box is the illustration of the model, its name (e.g. Tipper) and the words "Made to Scale" and "Gaily Coloured". Some models have the name preceded by the words "The Modern", e.g. "The Modern Tipper". On the other two sides of the box is printed "Substantially made, special wheel suspension thus ensuring, true running" on 3 lines (the commas in the preceding text identify the end of each line), followed by "Made in England" on a fourth line. On the folding end tabs is printed "TP Series" and "N/[model number]". Some boxes for the mechanical models also have the name of the model on the end tabs, e.g. "Saloon". Note: it has been suggested on some forums that some castings are available as rubber band powered items under a different brand name. This page will later link to pages describing the toys TP produced during this short period of production. Hello Ian and fellow collectors. The model at number 5 in the TP Series is as far as I am concerned a Bentley MkVI 2 door coupe and made as a Sister car to the Rolls-Royce Silver Wraith in the same range. I am happy to debate this further to finally confirm the model's true identity.